There are two things that I’ve become obsessed with this year: ginger and goat cheese. I haven’t yet found a way to combine the two, but have made a lot of recipes calling for one or the other. Here’s a dinner with both. As one can imagine, this dish turns out very different with summer and winter tomatoes. I first made it last summer; it was awesomely full of flavor. Unfortunately, the first time I made it this winter, it was thin, watery, and tasteless. I stared at my spoon in sad disgust. And then my mom handed me a can of tomato puree I’d purchased for another dish – I dropped that in and it was so much better! In the ingredients below, I’ve listed a can of tomato puree, but if you’re using summer tomatoes, it won’t be necessary. Preheat oven to 400°F. Place tomatoes, cut side up, on large baking sheet. Drizzle with olive oil, mixed with pinch of salt and pepper. Roast until tomatoes are brown and tender, about 1 hour. Cool slightly.Transfer tomatoes and any accumulated juices to food processor. Using on/off turns, process until slightly chunky. While you’re heating up the soup, cut bread into 1/2 inch slices, drizzle with olive oil and pepper, and slide into the oven at 400-425 until gold and crispy. Here’s where you can either stir in the basil or offer up goat cheese for people to drop into their soup. Or both. Goat cheese can also be spread on the crustinis. Adapted from Bon Appétit recipes. I like my gingerbread to have a kick to it. 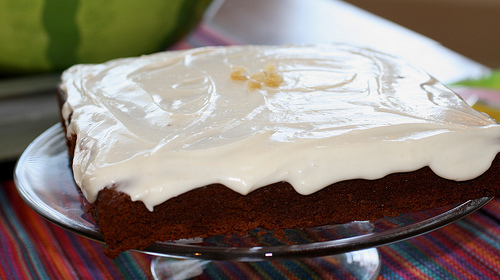 This recipe makes a moist, spicy cake; the frosting just gives it that extra little shock of ginger. 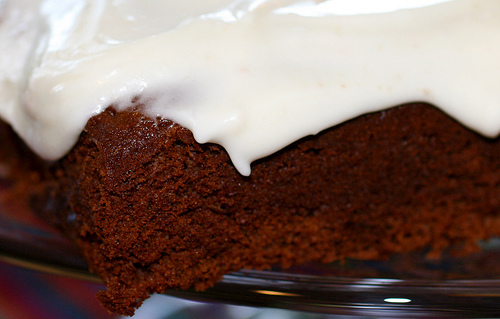 The frosting recipe makes double what you’ll need for the cake – but if you plan ahead, you could use the frosting on something else. It’ll hold for a few days, and just get a little spicier as it gets infused with the ginger. Yum. Preheat oven to 350°F. Butter 9x9x2-inch metal baking pan. Whisk first 7 ingredients in medium bowl to blend. Using electric mixer, beat butter in large bowl until fluffy. Add brown sugar and egg and beat until blended. Beat in molasses, then flour mixture. Using rubber spatula, stir in 1/2 cup boiling water. Transfer batter to prepared pan. Bake gingerbread until tester inserted into center comes out clean, about 40 minutes. Transfer pan to rack and cool gingerbread completely in pan. After cooled, place gingerbread on surface like a cake stand for easy icing. Using spatula, spread icing on cooled cake. I placed bits of crystalized ginger on mine – it serves as both decoration and a little bit of crunch. I’m debating adding it to the cake next time. We’ll see how that goes. America’s Test Kitchen recommends using canned whole tomatoes during the winter months (and then roasting them for more flavor). I have a recipe for it that I keep meaning to try, but haven’t gotten around to yet.